The feed conversion ratio (FCR) is an important performance indicator for pig producers, as it has an influence on production costs. For the 12 months to September 2018, the feed conversion ratio had improved compared to the 2017 average, according to the latest Agrosoft data. For the finishing herd, the FCR decreased by 2% from 2.86 to 2.79. Meanwhile, the FCR for the rearing herd decreased by a more substantial 6% over this period, from 1.77 to 1.65. Without this improvement, overall production costs would have been around 3p/kg higher (£2.30/head) in the 12 months ending September. Rising feed prices mean this saving has become increasingly important. 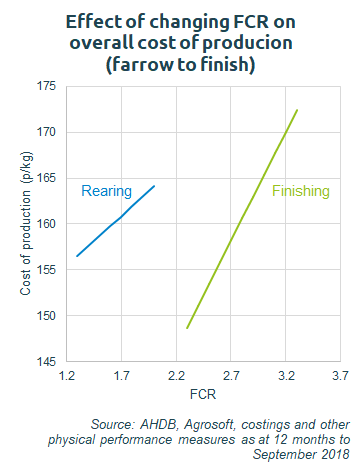 AHDB has recently produced a new set of cost of production calculators that will calculate your FCR for the rearing and finishing stage. You can compare this with the average, top third and top 10% of GB producers on the AHDB pork site, by clicking HERE. Bethan Wilkins, a market intelligence analyst at AHDB, said: “While a low FCR saves on feed costs, focusing on a single KPI can cause problems in other areas. Careful monitoring is required to ensure that overall performance is actually improving. For example, if we look at the top third and top 10% of GB herds by FCR, we can see that these herds generally have below average daily weight gains, especially at the rearing stage. Ms Wilkins added: “Looking at GB averages, average daily weight gain fell for both the rearing (-46g to 470g/day) and finishing herds (-19g to 814g/day) in the 12 months to September, compared to the 2017 average. This reduced the potential cost saving by around 0.5p/kg. “However, it is possible to improve FCR without a drop in daily weight gain. 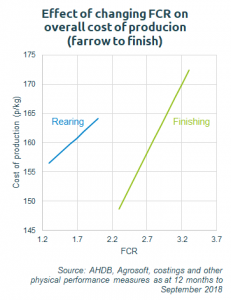 In fact, over the past 10 years there is no correlation between FCR and weight gain at the rearing stage, and for the finishing stage both measures have improved. Genetic developments have likely influenced these changes.